In September, we were honored to have Dr. Bernard Lafayette visit us in the Bay Area. He joined us as we visited three pods inside the San Bruno County Jail to visit with 150 men, and we were joined by about 150 more from the community that evening to celebrate the International Day of Peace. Here are the videos of both events. Doc speaks on a variety of topics, including stories from his time spent organizing with Martin Luther King, on the meaning of the concept of “turning the other cheek,” the importance of working with youth, and much more. Part 1 of the jail visit – Openings, testimonials and poetry performances from the men. Part 2 of the jail visit – Dr. Lafayette’s Presentation, Q & A, and comments from the men. Part 1 of the evening event – Openings, stories and poetry performances from local youth, stories and updates from PPWN. Part 2 of the evening event – Dr. Lafayette’s presentation and Q&A from the crowd. 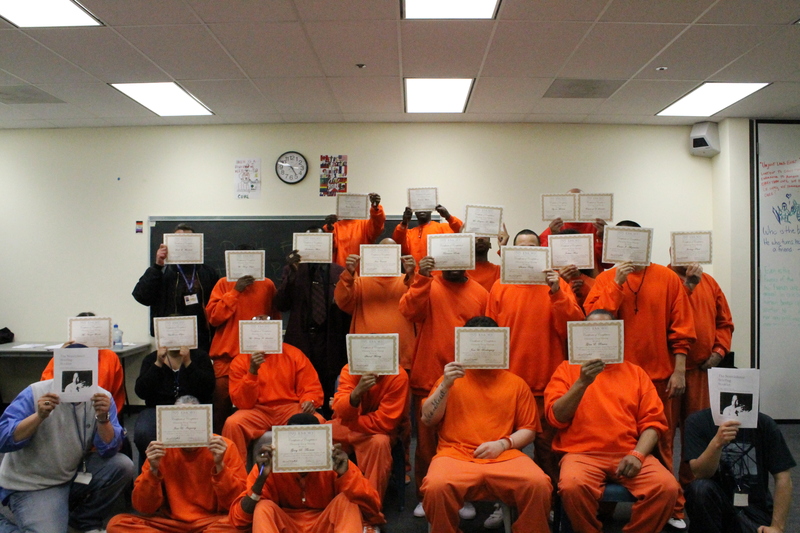 Recently, PPWN has ramped up our work inside the San Bruno County Jails. Since April of this year, we have conducted two-day workshops in Kingian Nonviolence for 200 incarcerated men. We have already scheduled our next four workshops, which will allow us to reach as many as 200 more by the end of October, and we are expanding into some of the other jails within San Francisco County. It has been such an honor for us to do this work with these men. The wisdom and the love that they have shown us each time we go in is an inspiration for us and helps sustain us as we move forward in this work. Here are some stories that we’d like to share with everyone from our most recent workshops. This project is currently unfunded, and sustained only through the love we have for this work. Please consider supporting PPWN so that we may continue to offer our workshops to the incarcerated community. Check out this interview with Nicamer Tolentino, a Program Coordinator for the San Francisco Sheriff’s Department. Nicamer participated in a two-day workshop in Kingian Nonviolence in February and immediately saw how it could help inside the San Bruno County Jail, where he works. Our program inside the jail is possible only because of Nicamer’s commitment to serving the community inside. PPWN is grateful to Nicamer for inviting us into his workplace, and for his commitment to building the Beloved Community inside the San Bruno County Jail!!! “These past two days, I didn’t even feel like I was in jail,” remarked one of the participants of this month’s two-day workshop inside the San Bruno County Jail. It was two days filled with intense discussions and important lessons for all of us, as trainers and participants. It’s an honor for us every time we have the opportunity to go inside, and hearing comments like this really reinforce our commitment to this work. To be able to feel free in a community with so much violence – even if for only a moment – makes the early morning trip all the way across the bay well worth it. “I wish you were there that night when I let anger get the best of me, maybe I wouldn’t be here. Homies in my hood don’t speak the same language as you. I want to learn more so I don’t make the same mistakes again”, one of the men from the San Bruno County Jail shared after reviewing the 6 Principles of Kingian Nonviolence and the “Pilgrimage to Nonviolence’. This blog will share with you the participants evaluation of the Kingian Nonviolence 2 day workshop, audio of the men discussing racsim, and positive peace poetry describing where they want to go, PPWN’s next steps and what we were able to accomplish over all. On April 9-10, 2012, the Positive Peace Warrior Network conducted the first 16 hour Kingian Nonviolence 2Day Core Intoroductory Orientation. As this workshop was approaching I was reminded of one of Dr. Martin Luther King, jr.’s speeches titled, “The Drum Major Instinct”. Excerpts from the The Drum Major Instinct delivered By Dr. Martin Luther King, Jr on February 4, 1968. You are currently browsing the archives for the San Bruno County Jail category.